Megaliths are often useful to observe movements in the celestial sphere. Megalith's usability as observatory does NOT prove they where intend to! An alignment (a row of standing stones) can be used to observe certain point on the horizon, for example the point of sunrise on a specific moment like midsummer solstice. A combination of lines of view can be used as calendar. Also movements of the Moon, planets and stars can be examined using an alignment. Farther standing stones and remarkable landscape points can be used as lines of view. Around midwinter and midsummer during a week the sun seems to rise (or set) on the same point. This phenomenon is called the 'solstice'. This is a consequence of the Earth's elliptic orbit around the Sun. 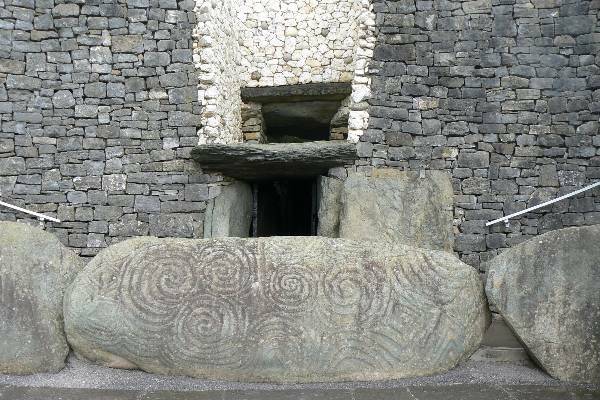 Many chambered tombs are like a tunnel, sunbeams can only reach the chamber on specific moments, for example Newgrange (Ireland), where the sunbeams bring light into the chamber on winter solstice. Well known as a "spring-equinox-marker" is Cairn 'T' in Loughcrew, Ireland. Of course also other dates can be marked, if the tunnels is built in another direction. An arrangement positioned to the south could also be used, because the Sun's maximal ascension (noon) changes during the year. During midwinter the Sun's ascension above the horizon is lowest, the highest ascension is reached at noon around June 21. A southwards arrangement gives the discomfort of the blinding sunbeams, dangerous for the observer. In an arrangement directed to the point of sunrise or sunset, the sunlight won't be to strong, but early in the morning the observation can be by troubled by fog.